One of the promises I’ve made to myself is to slow down and truly enjoy small things in life. 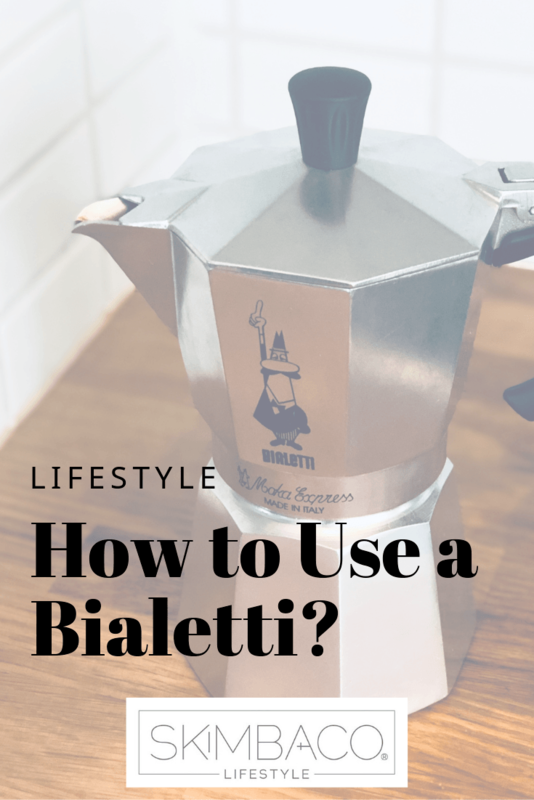 One of my new loves is simply taking time to make my lattes on the morning with an Italian Bialetti stainless steel stove top espresso maker. Or should I say caffè latte..? On our first day in Italy my husband ordered due lattes, and I was slightly amused we got two hot cups of milk. I do like mine with extra milk, but not without espresso, thank you very much. If you want to splurge on an espresso machine, read which one is my favorite. 1. Add fresh cold water to the water tank – that’s the lower part of the espresso maker, and you can unscrew it from the top. Fill it up to safety valve, don’t top it. 2. Put the coffee filter on the top of the water tank and fill it with ground coffee. Important: most espresso machines require you to press down the coffee, but do not press down the coffee grounds with Bialetti. It took me a while to get rid of an old habit. 3. 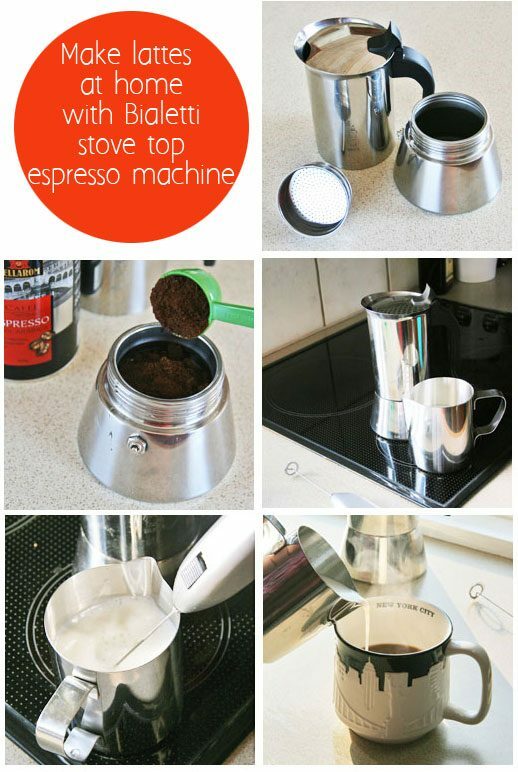 Screw the top on the water tank and place your espresso maker on the stove top. I use high heat on an electric stove top. Lower heat on gas stove top works better, but after a few tries you’ll learn what works the best for you. The coffee is ready when it makes this gurgling sound and stops percolating coffee. 4. Steam your milk in the frothing pitcher, and once it starts warming up, froth it with the frothing wand. 5. Pour your coffee in a cup and pour the milk on the top slowly. You can use a spoon to first pour the milk and then scoop as much froth on the top as you like. You can do without the frothing pitcher, and you can even warm your milk in the microwave, or in a small pot, and then froth it with the frothing wand, or even whisk it with a small whisk, which takes much longer but actually tastes better than this faster method. I do recommend getting good quality coffee meant for espresso and ground very thin, you can’t make espresso coffee with coarsely ground coffee. The best is if you also get a coffee grinder and grind it right before brewing. Always remember to storage your coffee in an air-tight container. I didn’t add how much coffee or how much milk to use on purpose – it depends what kind of coffee you use and how much milk you like in your latte. I use different amounts depending which coffee brand I’m using, or which milk I’m using ( for example less milk when it has more fat, more milk if I use skinny milk). NOTE: I bought the Bialetti stainless steel espresso maker, it makes a little bit smoother tasting coffee than the original aluminum pot, the Bialetti Moka. I read this nice article about Bialetti and caffèlatte. :) I sldo have a Bialletti caffè maker, but mine is a Moka Express. The only thing I’d like to offer is, to try Mokarabia Regal with your Bialetti machine. That’s certainly one of the best. I wish you peaceful mornings. hi how many cup bialetti do you use to make your lattes?